In my book club this month, the chosen book was Rebecca by Daphne Du Maurier. I'd never read any Daphne Du Maurier books before but really got into Rebecca and thoroughly enjoyed it. The person hosting our discussion decided, true to the book, that she would put on an English tea with scones - as Mr and Mrs de Winter had every day at Manderley, in the book. As I need gluten free food and don't eat animal foods or sugar, I offered to make my own scone - rather than have her make something special for me. I've actually never made gluten free scones before, never mind vegan gluten free scones, so it seemed like a good challenge. And I've had some success. I did actually use a little fat in the recipe. Normally I bake without oil but I was changing so many things in a recipe that I left in the fat. 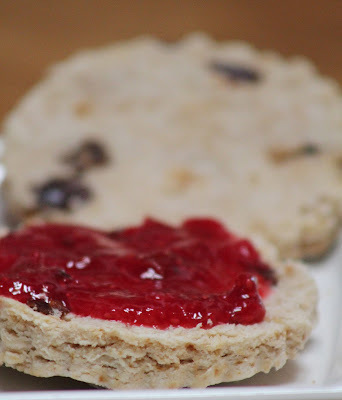 The scones have a wonderful texture to them and taste just like a good scone should. They didn't rise in the oven however and didn't brown on top as you would expect from a traditional scone but I rolled them thick so they didn't look flat - and the taste more than made up for lack of browning. I had them with homemade sugar free plum chia jam. Delicious. 1. Pre-heat the oven to 425F or 220C. Line a baking tray with non-stick baking paper. 2. Add the vinegar to the milk and let sit. 3. Sieve the flour into a bowl and stir in the baking powder. 4. Rub in the margarine with your fingers until fully incorporated. 5. 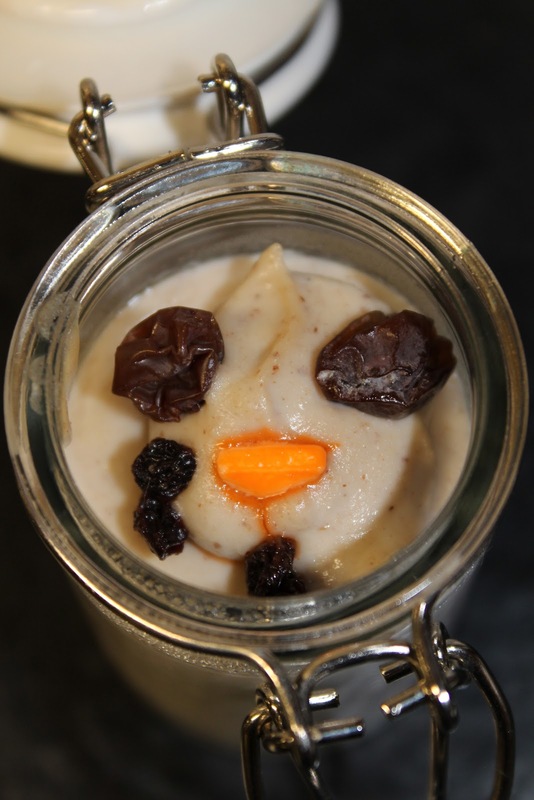 Stir in the sugar and raisins. 6. 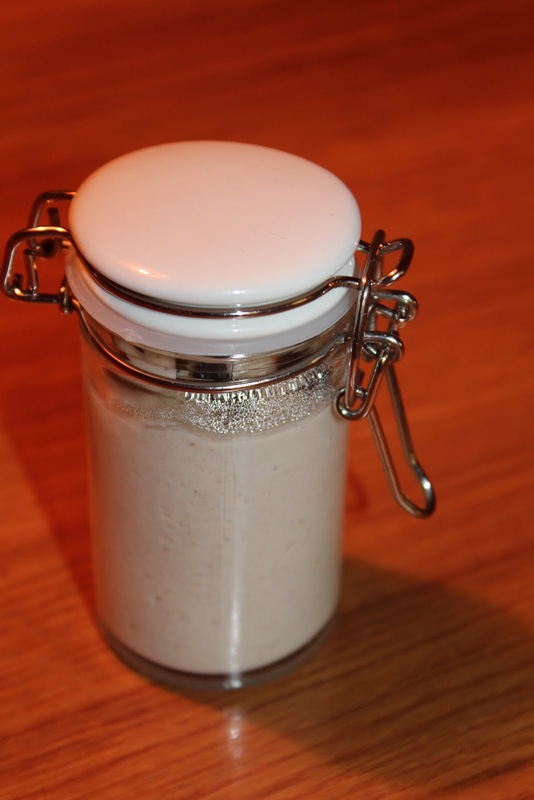 Add nearly all the milk solution and bring the mixture together with your hands to form a soft dough. Don't over work. 7. If necessary add the remaining milk to bind it all together. 8. Roll out gently on a floured board to a thickness of about 1 inch. 9. Cut out the dough with a pastry cutter and place the scones on the baking tray. 10. Reroll the dough scraps as needed to use it all up. 11. Bake the scones for around 20 minutes. 12. Leave to cool and enjoy with sugar free jam and coconut cream, if desired. They are best eaten the same day that you make them. I will be trying the recipe again, without the fat and will let you know how I get on. 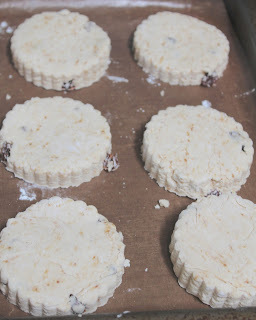 I think I'll do savory scones next too.....with some nutritional yeast in them to give a cheesy flavor. I hope Mrs de Winters would be satisfied and wouldn't return them to the kitchen! I think she'd enjoy them, like I have! I made some little melted snowmen in honor of it not snowing here! Get it? The two raisins are his eyes, his carrot nose and currants as his buttons....! 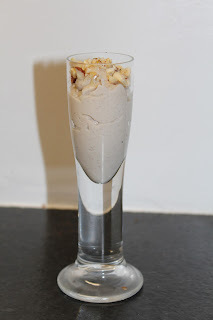 The dessert is a hazelnut cream. It's rich and full of flavor - which is why you only need a small amount. Toast the hazelnuts in a 350F oven for approx 5 minutes until golden and fragrance. Transfer them onto to a kitchen towel and rub them in the towel to remove most of their skin. Let them cool. (If serving in a glass, finely chop 1/2 tablespoon for garnish). Place the remaining skinned hazelnuts, sugar, and lemon zest in a food processor until finely ground into a paste. 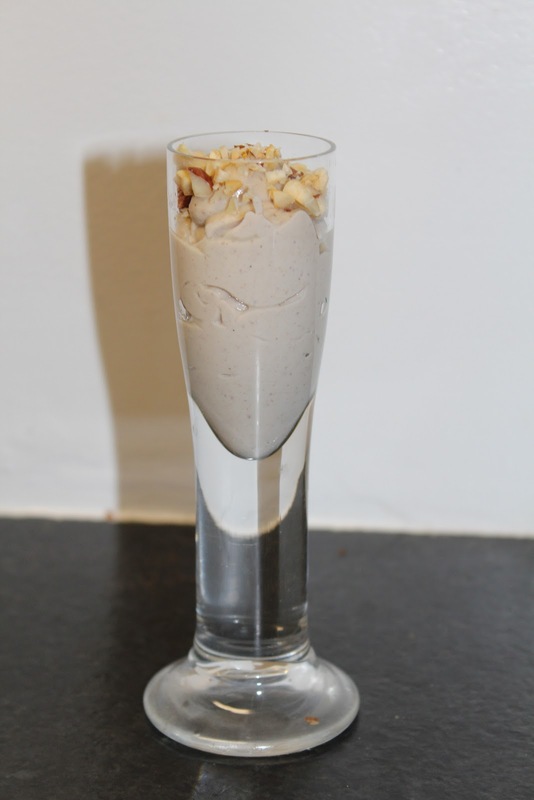 Combine the hazelnut mixture with the milk, vanilla seeds, cinnamon stick in a medium saucepan. Bring to a boil the reduce the temperature and simmer for 15 minutes, stirring occasionally, until it begins to thicken. Remove the cinnamon stick. Pour into small jars and decorate or into shot glasses and sprinkle on chopped hazelnuts.